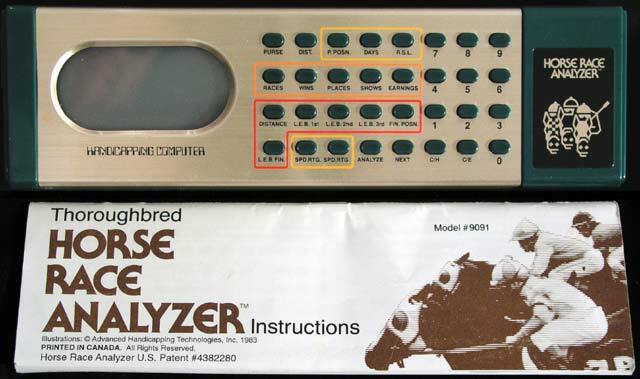 This is Advanced Handicapping Technologies, Inc.'s Thoroughbred Horse Race Analyzer Computer. From the box: "It is programmed for 3 year-or-older horses running on a fast dirt or firm turf track, at distances of 6 furlongs or longer. It is not designed to handicap harness races (trotters or pacers), quarter horse races, dog races or "Maiden" races. In a computer study at a leading university, on a sample of 946 races, this computer's top rated horse finished 1st, 2nd or 3rd 58% of the time." Do I have this? Yes, boxed.